Mediterranean Sea, is intercontinental sea which separate europe from africa connected to the Atlantic Ocean on the west to Asia on the east. It has often been called the incubator of Western civilization. This ancient “sea between the lands” occupies a deep, elongated, and almost landlocked irregular depression lying between latitudes 30° and 46° N and longitudes 5°50′ W and 36° E. Its west-east extent from the Strait of Gibraltar between Spain and Morocco to the shores of the Gulf of Iskenderun on the southwestern coast of Turkey—is approximately 2,500 miles (4,000 km), and its average north-south extent, between Croatia’s southernmost shores and Libya, is about 500 miles (800 km). The Mediterranean Sea, including the Sea of Marmara, occupies an area of approximately 970,000 square miles (2,510,000 square km). ● Ibiza, one of the Balearic Islands, in the western Mediterranean Sea off the east coast of Spain. ● The western extremity of the Mediterranean Sea connects with the Atlantic Ocean by the narrow and shallow channel of the Strait of Gibraltar, which is roughly 8 miles (13 km) wide at its narrowest point; and the depth of the sill, or submarine ridge separating the Atlantic from the Alboran Sea, is about 1,050 feet (320 metres). To the northeast the Mediterranean is connected with the Black Sea through the Dardanelles(with a sill depth of 230 feet [70 metres]), the Sea of Marmara, and the strait of the Bosporus (sill depth of about 300 feet [90 metres]). To the southeast it is connected with the Red Sea by the Suez Canal. ● The sea was an important route for merchants and travellers of ancient times that allowed for trade and cultural exchange between emergent peoples of the region. The history of the Mediterranean region is crucial to understanding the origins and development of many modern societies. Current Density : Mediterranean overflow current With a temperature of 13.4 °C (56.1 °F) and a salinity of 38.4 practical salinity units (psu, which are…Physiographic And Geologic Features. Alboran Basin is east of Gibraltar, between the coasts of Spain and Morocco. The Algerian (sometimes called the Algero-Provencal or Balearic) Basin, east of the Alboran Basin, is west of Sardinia and Corsica, extending from off the coast of Algeria to off the coast of France. These two basins together constitutethe western basin. The Tyrrhenian Basin, that part of the Mediterranean known as the Tyrrhenian Sea, lies between Italy and the islands of Sardinia and Corsica. ● The eastern Mediterranean is subdivided into two major basins. The Ionian Basin, in the area known as the Ionian Sea, lies to the south of Italy, Albania, and Greece, where the deepest sounding in the Mediterranean, about 16,000 feet (4,900 metres), has been recorded. A submarine ridge between the western end of Crete and Cyrenaica(Libya) separates the Ionian Basin from the Levantine Basin to the south of Anatolia (Turkey); and the island of Crete separates the Levantine Basin from the Aegean Sea, which comprises that part of the Mediterranean Sea north of Crete and bounded on the west and north by the coast of Greece and on the east by the coast of Turkey. The Aegean Sea contains the numerous islands of the Grecian archipelago. 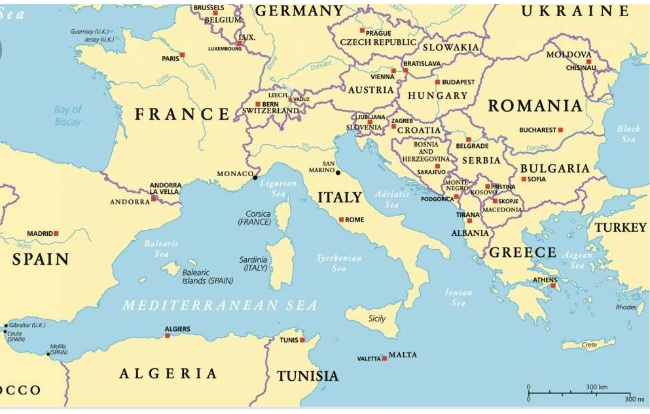 The Adriatic Sea, northwest of the main body of the eastern Mediterranean Sea, is bounded by Italy to the west and north and by Slovenia, Croatia, Bosnia and Herzegovina, Montenegro, and Albania to the east. Until the 1960s the Mediterranean was thought to be the main existing remnant of the Tethys Sea, which formerly girdled the Eastern Hemisphere. Studies employing the theory of seafloor spreading that have been undertaken since the late 20th century, however, have suggested that the present Mediterranean seafloor is not part of the older (200 million years) Tethys floor. The structure and present form of this tectonically active basin and its bordering mountain system have been determined by the convergence and recession of the relatively stable continental plates of Eurasia and Africa during the past 44 million years. The interpretation of geologic data suggests that there are, at present, multiple main areas of collision between Africa and Eurasia, resulting in volcanism, mountain building, and land submergence. The Tyrrhenian Basin of the western Mediterranean has two exits into the eastern Mediterranean: the Strait of Sicily and the Strait of Messina, both of which have been of great strategic importance throughout Mediterranean history. The submarine relief of the Sicilian channel is rather complicated; the group of islands comprising Malta, Gozo, and Comino, all of which consist of limestone, stands on a submarine shelf that extends southward from Sicily. ● The widest continental shelf is off Spain at the Ebro River delta, where it extends about 60 miles (95 km). Similarly, west of Marseille, France, the shelf widens at the Rhone Riverdelta to 40 miles (65 km). The shelf is narrow along the French Riviera, the gradient of its slope increasing where cut by canyons and troughs. The narrow shelves continue off the Italian peninsula, generally with lower, more-gradual slopes. Along the coast at the base of the Atlas Mountains of North Africa, a narrow shelf stretches from the Strait of Gibraltar to the Gulf of Tunis with a slope marked by many troughlike indentations. ● The coasts of the western Mediterranean, just as those of the eastern basin, have been subjected in recent geologic times to the uneven action of deposition and erosion. This action, together with the movements of the sea and the emergence and submergence of the land, resulted in a rich variety of types of coasts. The Italian peninsula underwent considerable uplift in post-Pliocene times (i.e., within the past 2.6 million years), as a result of which a strip of older rocks has been exposed on the Adriatic flank of the Apennines. The Italian Adriatic coast is typical of an emerged coast. The granite coast of northeastern Sardinia and the Dalmatian coast where the eroded land surface has sunk, producing elongated islands parallel to the coast, are typical submerged coasts. The deltas of the Rhone, Po, Ebro, and Nile rivers are good examples of coasts resulting from silt deposition. ● The Sicilian straits scarcely exceed 1,500 feet (460 metres) in depth, so that there is essentially a shelf from Tunisia to Sicily separating the Mediterranean into two parts. South of the straits the shelf widens to as much as 170 miles (275 km) off the Gulf of Gabes (Qābis) on the eastern coast of Tunisia. The first mud appears on the approach to the Nile delta, and the shelf widens again to 70 miles (115 km) off Port Said, Egypt, at the entrance to the Suez Canal. Narrow shelves continue along most of the northern shore of the Mediterranean. An exception is the broad shelf extending for 300 miles (485 km) along the inner portion of the Adriatic Sea. Relatively deep water is found along much of the coasts of Croatia, Bosnia and Herzegovina, and Montenegro and along the southern Italian coast, in contrast to the gentle slopes of the Po River region. ● The northern shores of the eastern Mediterranean are highly complex and, unlike the southern shores, have variable fold mountains that offered favourable sites for the development of the Mediterranean civilizations. The north coast of Africa bordering the eastern Mediterranean is low-lying and of monotonous uniformity except for the Cyrenaica highlands in Libya, which lie to the east of the Gulf of Sidra. The largest islands of the eastern Mediterranean are Crete and Cyprus, both of which are mountainous. Mediterranean hydrodynamics are driven by three layers of water masses: a surface layer, an intermediate layer, and a deep layer that sinks to the bottom; a separate bottom layer is absent. Deepwater formation and exchange rates and the processes of heat and water exchange in the Mediterranean have provided useful models for studying the mechanisms of global climatic change. ● The surface layer has a thickness varying from roughly 250 to 1,000 feet (75 to 300 metres). This variable thickness is determined in the western basin by the presence of a minimum temperature at its lower limit. In the eastern basin the temperature minimum generally is absent, and a layer of low-temperature decrease is found instead. The intermediate layer is infused with warm and saline water coming from the eastern Mediterranean and is characterized by temperature and salinity maxima at 1,300 feet (400 metres). This layer is situated at depths between 1,000 and 2,000 feet (300 and 600 metres). The deep layer—containing the great bulk of Mediterranean water—occupies the remaining zone between the intermediate layer and the bottom. In general, the water of this layer is homogeneous. ● The Mediterranean Sea receives from the rivers that flow into it only about one-third of the amount of water that it loses by evaporation. In consequence, there is a continuous inflow of surface water from the Atlantic Ocean. After passing through the Strait of Gibraltar, the main body of the incoming surface water flows eastward along the north coast of Africa. This current is the most constant component of the circulation of the Mediterranean. It is most powerful in summer, when evaporation in the Mediterranean is at a maximum. This inflow of Atlantic water loses its strength as it proceeds eastward, but it is still recognizable as a surface movement in the Sicilian channel and even off the Levant coast. A small amount of water also enters the Mediterranean from the Black Sea as a surface current through the Bosporus, the Sea of Marmara, and the Dardanelles. ● In summer, Mediterranean surface water becomes more saline through the intense evaporation, and,correspondingly, its density increases. It therefore sinks, and the excess of this denser bottom wateremerges into the Atlantic Ocean over the shallow sill of the Strait of Gibraltar as a westward subsurface current below the inward current. The inflowing water extends from the surface down to 230 or 260 feet (70 or 80 metres). The Mediterranean has been metaphorically described as breathing—i.e., inhaling surface water from the Atlantic and exhaling deep water in a countercurrent below. ● Surface circulation of the Mediterranean consists basically of a separate counterclockwise movement of the water in each of the two basins. Because of the complexity of the northern coastline and of the numerous islands, many small eddies and other local currents form essential parts of the general circulation. Tides, although significant in range only in the Gulf of Gabes and in the northern Adriatic, add to the complications of the currents in narrow channels such as the Strait of Messina. ● Historically, large seasonal variations in the Nile’s discharge influenced the hydrology, productivity, and fisheries of the southeastern part of the Mediterranean. The Nile’s inflow reduced the salinity of the coastal waters, which increased both their stratification and productivity. Construction of the Aswan High Dam(1970), however, stopped the seasonal fluctuation of the discharge of the Nile water into the Mediterranean. Salty water enters the Mediterranean to some degree from the Red Sea via the Suez Canal. The parallel of 40° N latitude runs through the middle of the western basin, whereas the corresponding latitude of the eastern basin is 34° N; this explains the higher surface temperature of the latter. The highest temperature of the Mediterranean is in the Gulf of Sidra, off the coast of Libya, where the mean temperature in August is about 88 °F (31 °C). This is followed by the Gulf of Iskenderun, with a mean temperature of about 86 °F (30 °C). The lowest surface temperatures are found in the extreme north of the Adriatic, where the mean temperature in February falls to 41 °F (5 °C) in the Gulf of Trieste. Ice occasionally forms there in the depth of winter. In the deep zone the temperature range is small—approximately 55.2 °F (12.9 °C) at 3,000 feet (900 metres) and 55.6 °F (13.1 °C) at 8,200 feet (2,500 metres)—and temperatures remain constant throughout the year. ● The salinity of the Mediterranean is uniformly high throughout the basin. Surface waters average about 38 parts per thousand except in the extreme western parts, and the salinity can approach 40 parts per thousand in the eastern Mediterranean during the summer. Deepwater salinity is 38.4 parts per thousand or slightly less. As in all other seas and oceans, chlorides constitute more than half of the total ions present in Mediterranean water, and the proportions of all the principal salts in the water are constant. ● Levels of dissolved oxygen vary with the origin of the different water masses. The surface layer down to 700 feet (210 metres) shows a high oxygen level throughout the Mediterranean. The intermediate layer formed by the sinking of the surface layer in the eastern basin has a high oxygen level where it is freshly formed in this basin, but, as it moves westward, it loses some of its oxygen content, the lowest values occurring in the Algerian Basin. The transition layer between the intermediate and the deep water has the lowest level of dissolved oxygen. Airflow into the Mediterranean Sea is through gaps in the mountain ranges, except over the southern shores east of Tunisia. Strong windsfunneled through the gaps lead to the high evaporation rates of summer and the seasonal water deficit of the sea. The mistral—a cold, dry northwesterly wind—passes through the Alps-Pyrenees gap and the lower Rhône valley;the strong north easterly bora passes through the Trieste gap; and the cold easterly levanter and the westerly vendaval pass through the Strait of Gibraltar. Hot, dry southeasterly winds—known locally as the sirocco, ghibli (gibleh), or khamsin—frequently blow into the Mediterranean basin from the Sahara and the Arabian Peninsula as low-pressure centres traverse the sea in late winter and early spring. These winds reduce heat and moisture in the surface waters to a significant degree by evaporative cooling, and this colder, denser surface water sinks. Atmospheric conditions over the Mediterranean also increase the salinity of incoming Atlantic water because of the evaporation of surface waters. ● Mediterranean climate is confined to coastal zones and is characterized by windy, mild, wet winters and relatively calm, hot, dry summers. Spring, however, is a transitional season and is changeable. Autumn is relatively short. ● The amount and distribution of rainfall in Mediterranean localities is variable and unpredictable. Along the North African coast from Qābis (Gabès) in Tunisia to Egypt, more than 10 inches (250 mm) of rainfall per year is rare, whereas on the Dalmatian coast of Croatia there are places that receive 100 inches (2,500 mm). Maximum precipitation is found in mountainous coastal areas. 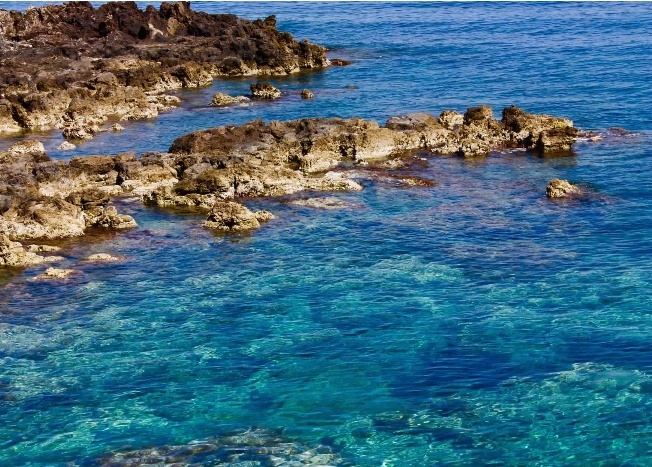 Plant nutrients such as phosphates, nitrates, and nitrites are scarce in the Mediterranean Sea. Just as in all other seas, these nutrients show seasonal fluctuations, generally with a rise in the spring, the phytoplankton blooming season. However, several factors account for the scarcity of nutrients in Mediterranean waters, the most important being that the Mediterranean receives most of its water from the surface water of the Atlantic Ocean. Despite low nutrient levels, the Mediterranean has a rich diversity of marine biota. Nearly one-third of its roughly 12,000 species are endemic. ● The effective potential productivity in various regions of the Mediterranean can be measured by radioactive methods using carbon-14 dating to determine the amount of carbon produced in a given volume of water over a period of time. The lowest values are observed in the Levant and also in the Ionian Basin. The highest primary-production values in the Mediterranean Sea have been observed in springtime (March–May) off the Egyptian coast in areas under the influence of the outflow of the Nile. ● Commercial fisheries are highly valuable in the nutrient-poor Mediterranean. There is great demand for fish, and total catches for consumption in Mediterranean countries—both from within and outside the region—constitute a significant portion of the total world catch. The high price of fresh fish in most Mediterranean countries has favoured the development of a large number of small-scale local fisheries, which take small catches in short trips. Though the boats used rarely exceed 70 feet (20 metres) in length, their numbers are sufficient to deplete the local stocks through overfishing. ● The tendency to overexploitation is strengthened by the use of trawl nets with very small mesh size that retain the smallest individuals. Efforts to reduce the catch of undersized fish through controlling mesh size have not been successful, because equipment varies from country to country and compliance is difficult to monitor. The most recent trend has been to use drift nets up to 15 miles (24 km) long that extend 40 feet (12 metres) into the water. These nets kill many noncommercial species, including dolphins, whales, sea turtles, and the endangered Mediterranean monk seal. ● The fishes of the Mediterranean are related to subtropical Atlantic species. Of the demersal (bottom-living) fishes, flounder, soles, turbot, whitings, congers, croakers, red mullet, gobies, gurnard, lizard fish, redfishes, sea bass, groupers, combers, sea bream, pandoras, and jacks and cartilaginous fishes such as sharks, rays, and skates are all caught by the trawlers. Among the demersal fishes, hake is one of the more commercially important in all countries bordering the Mediterranean Sea. ● The coastal hake, sole, and red mullet fisheries have been seriously overexploited. Rocky coasts once provided a valuable harvest of crabs, shrimps, prawns, and other shellfish, but coastal pollution and overfishing have largely depleted natural fisheries. Aquaculture has become increasingly important, especially in the eastern Mediterranean. In Egypt, coastal lagoons have been impounded to raise fish. Growing number of industrialization, shoreline high populations, and tourism activity since the mid-20th century have resulted in severely polluted waters in many Mediterranean coastal areas. Pollution in the Mediterranean tends to remain near its source of discharge because of relatively weak tidal and current movements. Despite the absence of significant transborder effects, the countries of the region have agreed to cooperate to control the threat of marine pollution. Assisted by the United Nations Environment Programme(UNEP), 16 countries adopted the Mediterranean Action Plan (Med Plan) in 1975. The Med Plan comprises four elements: legal measures, institutional and financial support, integrated planning to prevent environmental degradation, and coordinated pollution monitoring and research. ● The two most important legal measures are the Barcelona Convention (1976), which calls for protective action against all forms of pollution, and the Athens Protocol (1980), which requires state parties to adopt programs to prevent and control pollution from land-based sources. The Med Plan has been widely regarded for successfully raising awareness of pollution in the Mediterranean; however, improvements in environmental quality under the plan have been limited. RADAR TO PREDICT "GUERRILLA RAINS"